Yeah, just the bitter gourd and fish balls, this soup relies on these ingredients for a last-minute explosion of its natural flavours. Simple, simple, simple. It’s all about simplicity, just like my principal concept of managing things. Simply, but never tolerate on the essentiality in nutritional values. I thought vegetables and fish balls are good enough to make up a vegetable-and-protein dish. Moreover, it’s boiled in soup. Low-fat, healthy and, it was delicious, but…. yet, not ‘so’ low-fat. Why? 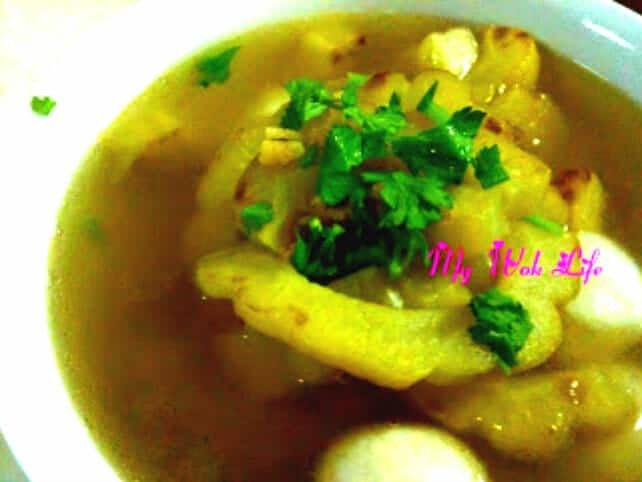 In order to make the bitter gourd more flavourful and easy to drink in soup (to make the soup taste more robust and not-so-bitter), I pan-fried the bitter gourd. Yes, extra oil has been loaded on with the additional step here. However, these fried bitter gourds did make the soup much more flavourful, on the other hand… We really liked it alot! So, give or take, it’s up to you (smile). 1) Heat large frying pan with 1 tablespoon of oil over medium fire. Pan fry the bitter gourd slices (in batches) till slightly softened and browned on both sides. Set aside. 2) Bring a pot of water to a boil over high heat. Place the fried bitter gourd in the boiling water. Reduce heat and simmer for 20 minutes. 3) Add fish balls, cook for 5 minutes. Season soup with fish sauce, white peper and salt. Stir to combine. Garnish and serve hot. A portion of my bitter gourd soup counts less than 100kcal! Tips: Choose the China phenotype, long, lighter green in colour and less wrinkled one, if you preferred less bitter taste.